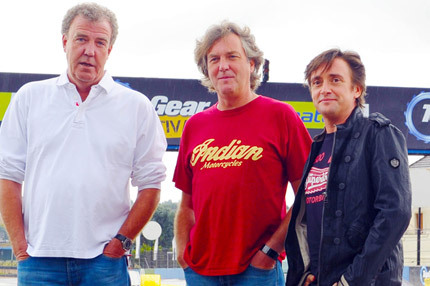 Start your engines, Top Gear is coming to Durban! 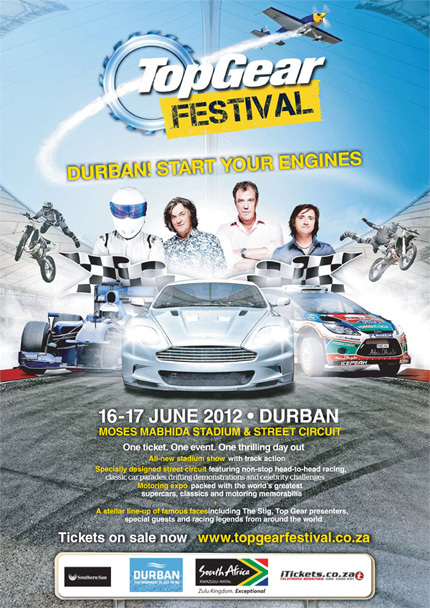 Top Gear Festival is making its debut at the Moses Mabhida Stadium in Durban KwaZulu-Natal, on 16 and 17 June 2012. 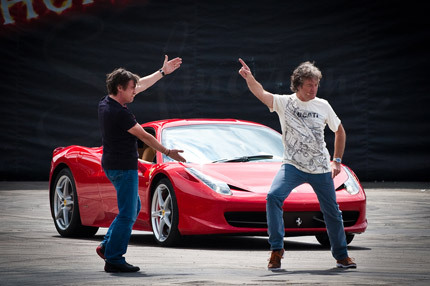 Fans will be happy to hear that the Festival, which includes a live stadium show, will be hosted by the full Top Gear Team of Jeremy Clarkson, Richard Hammond and James May and The Stig, who will be pushing the boundaries of live motoring festivities as they perform to their biggest audience to date. Top Gear Live events have entertained over one million people worldwide delivering new shows and jaw-dropping challenges each time – from a car bungee in Red Square, Moscow, to pulling off the world’s first-ever indoor loop-the-loop in London. 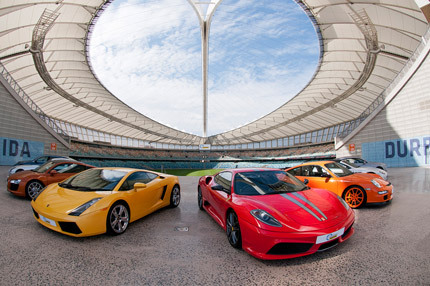 For this year’s South African Festival, Top Gear is proud to be partnering with the Province of KwaZulu-Natal and the City of Durban to bring Top Gear’s first ever stadium show to one of the world’s most iconic venues and architectural masterpieces: Moses Mabhida Stadium. With such a massive space to play with, Top Gear’s adrenaline-charged live show will be able to reach new heights, thrilling the audience with FMX bikes, donutting and flaming rally cars, exhilarating, hair-raising stunt manoeuvres by the Top Gear Live Stunt Driving Team and nonsensical challenges synonymous with Top Gear. Fans can also expect some of the world’s finest supercars as well as cars modified beyond belief – all delivered with the irreverent humour one would expect from a Top Gear event. Visitors will also get the unique opportunity to see their favourite presenting trio arrive on a motorised version of the famous Top Gear studio set! 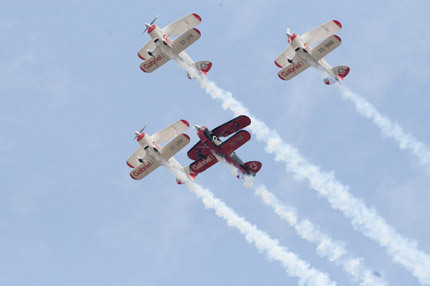 The 2012 event offers a more interactive experience for the visitor, as the Moses Mabhida Stadium and its surrounding precinct and People’s Park provides an exceptional, world-class venue with the necessary infrastructure required to host this impressive motoring festival. As well as the live stadium show, visitors will also enjoy a huge variety of other exciting outdoor features situated around the precinct. 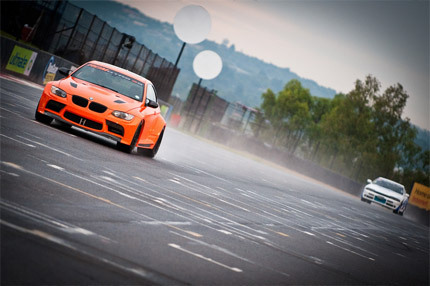 The City of Durban plays host to Top Gear’s first ever street circuit – over two kilometres long and winding around the streets of Durban. Spectators will see Stig power laps, head-to-head racing, supercars, drag racing, drifting, celebrity race challenges and more in the packed daily schedule. 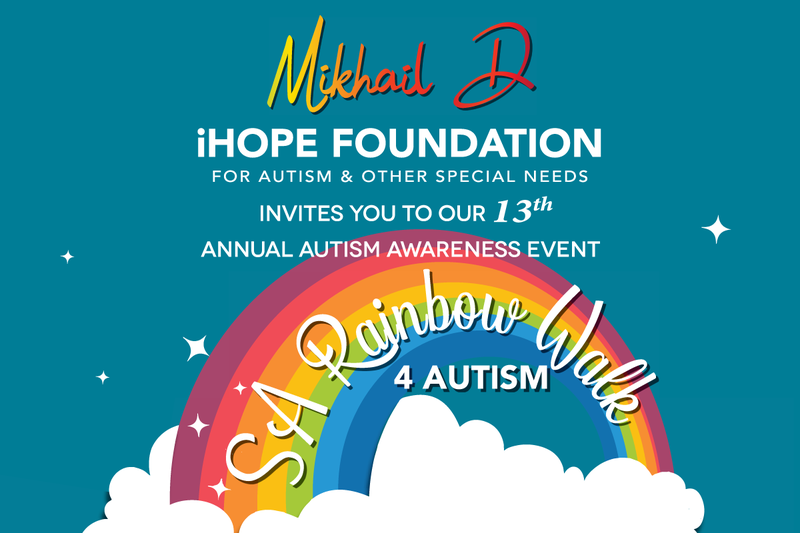 Local motorsport talent will also be showcased with Motorsport South Africa running the Super Production Car Series and the Volkswagen Polo Challenge Series on the Top Gear Street Circuit. And when visitors need a break from the action, they can head into the impressive motoring expo packed with some of the world’s greatest supercars, classics and motoring memorabilia. Last year’s festival was graced by racing legends David Coulthard, Jody Scheckter, Sir Stirling Moss, Derek Bell, Eddie Jordan and Sabine Schmitz as well as international motoring personalities and friends of Top Gear, Nick Mason and Tiff Needell and local F1 SuperSport Presenter Sasha Martinengo plus the man they call ‘the fastest man in Africa’, Gugu Zulu. This year’s line up is sure to get the adrenalin pumping. 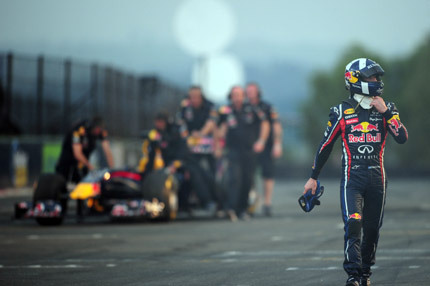 Jeremy, James and Richard have promised to rustle up a stellar showing for Durbanites in 2012! For guests coming from further afield, there is a full range of travel packages giving Top Gear enthusiasts the perfect excuse for a weekend in Durban. Packages range from R 3395-00 per person sharing for a package from Johannesburg – including return flights, 2 nights accommodation at a 3* Southern Sun Hotel on a bed and breakfast basis as well as a silver ticket to the Top Gear Festival. 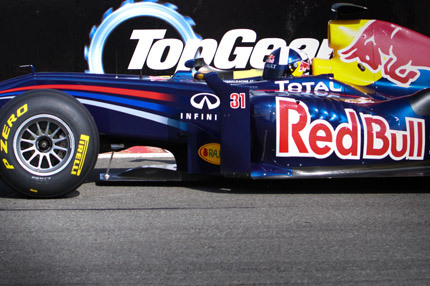 Visit www.topgearfestival.co.za for more information on the exclusive travel packages on offer.